In the latter case, you're almost certainly not going to close the sale — although you might have better luck a few months down the road. If the prospect isn't interested, then following up at this point is a waste of your time. Therefore, the first step in dealing with a time objection is finding out if the prospect is even considering making a purchase from you. To uncover the truth, you'll need more information. Usually, the best way to find out is to ask the prospect directly. You can say something like, “Absolutely. Can you tell me a little more about what's holding you back?” Your prospect may then admit that he needs to get approval from his boss or that he will be talking with a few of your competitors. If he won't give you any specifics, that's a warning sign that he may simply be uninterested. The prospect might also feel that he needs more information. In that case, you may be able to get things moving at once by giving him the facts he wants. For example, a prospect might use a timely objection to give himself a chance to check on your product's reviews online and see if you have a good or bad reputation with customers. If you can get him to admit as much, then handing him a few testimonials or even calling up an existing customer for him to speak with can be enough to close the sale then and there. If you can't get more details, try establishing a time limit. For example, you can say, “OK, let's talk next week and see if you're ready to proceed then. I'll give you a call — does Thursday at 11 work for you?” A prospect who refuses to set up a follow-up conversation is not serious about proceeding further, and you might as well put them in your inactive file. 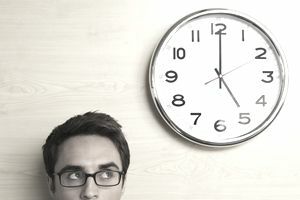 If the prospect agrees to set a time for another chat, your sale is still on track. You can also try probing for information with other people who know your prospect. This might mean having a talk with the gatekeeper (you did make a point of being friendly and likable with her, right?) or checking your network to see if anyone you know is also the prospect's friend or colleague. One approach that definitely won't work is to try to push the sales cycle along then and there. A time objection is the prospect's way of asking you for a chance to let him work on the purchase in his own way. He may just want to 'sleep on it' or he may need to collect more information before he'll be comfortable with finalizing things. If you try to push him into making a decision now, you're denying him that chance and you'll only make him more uncomfortable and probably angry with you. And of course, if he simply isn't interested in buying then hassling him will only make him more determined not to do business with you. Should You Use Presumptive, Advanced or Hard Closes for Sales? What Are the Top 9 Most Coveted Sales Position Titles?